It is the end of summer, 1989. 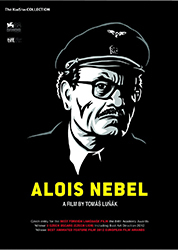 Alois Nebel works as a train dispatcher at a small railway station in the Sudetenland, a mountainous region on the Czechoslovak border. He is a loner who prefers old timetables to people, and he finds the loneliness of the station tranquil - except when the fog rolls in. Then he hallucinates, seeing ghosts and shadows from the dark past of this region where after WWII harsh revenge was exacted on the German population. Alois cannot get rid of these nightmares and with the help of the railway worker Wachek, who is eyeing Alois' job, he eventually ends up in a sanatorium. There he gets to know The Mute, a mysterious man carrying an old photograph who was arrested by the police after crossing the border. Not even electroshocks would make him speak and the police is unable to find out why he came to the Sudetenland or who he was looking for. One day The Mute takes his chance and escapes into the woods. Alois gets better and leaves the sanatorium. But things have changed outside. The Berlin wall has been torn down and the Communist regime in Czechoslovakia fell. Without a job and a place to stay, Alois does not know what to do. He decides to go to the Prague railway headquarters to seek help. There he finds the love of his life, Kveta the toilet custodian, and returns to the mountains to meet The Mute and fight the ghosts which have been haunting him for so long.